Owen Luder, CBE, (born 7 August 1928) is a British architect who designed a number of notable and sometimes controversial buildings in the United Kingdom in the 1960s and 1970s. He is a former chairman of the Architects Registration Board and president of the Royal Institute of British Architects. Owen Luder's designs included some of the most powerful and raw examples of Brutalist architecture, with massive bare concrete sculptural forms devoid of claddings or decoration - other than their inherent shapes. The British climate, with abundant rain and damp winters, is unkind to such unclad concrete buildings which rapidly become a shabby grey–brown colour and streaked with marks where rainwater has run down the façades. Poor maintenance has often exacerbated these problems. Some of Owen Luder's best known buildings are the now-demolished Tricorn Centre in Portsmouth, Catford Shopping centre in London, and Derwent Tower in Gateshead (which is being considered for demolition). Luder also designed the Trinity Centre Multi-Storey Car Park (which featured in the gangster movie Get Carter) in Gateshead. This is also soon to be demolished. Luder also designed the much-derided Southgate shopping centre in Bath, Somerset, which has recently been demolished to make way for a new multi-million pound development. Despite receiving awards when built, the Tricorn Centre was voted the 3rd ugliest building in Britain and was demolished in 2004 to mixed reactions and protests from an unrepentant Luder. 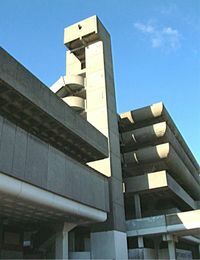 The Trinity Centre car park has also been subject to a number of redevelopment proposals and featured in the Channel 4 series Demolition in 2005. Luder also designed the conversion of a Victorian fire station into the South London Theatre in 1967.